There is a new superhero in town as Warner Bros.’ Shazam! hits cinemas on Friday, April 5, and the film’s director and producer are teasing that it may feature a LGBT+ superhero. Shazam! is the heartwarming, family-fuelled story of Billy Batson (played by Asher Angel), a teenager who is bestowed with superhero powers and has the ability to transform into an adult-size superhero by saying, “Shazam!” Zachary Levi stars as the adult Billy Batson. 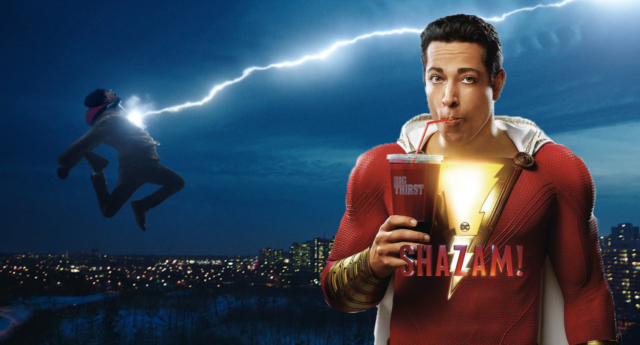 Speaking to PinkNews about the dearth of LGBT+ superheroes in Hollywood films, Shazam! director David F. Sandberg and producer Peter Safran teased that a LGBT+ hero could be on its way as soon as April 5. “Don’t want to put spoilers [out there] or anything … but I think you will see one sooner rather than later,” Sandberg teased to PinkNews. Elsewhere, Shazam! co-star Mark Strong, who plays villain Thaddeus Sivana, told PinkNews he thinks it’s time for a LGBT+ superhero in a major Hollywood film. “[I don’t think we’re] very far at all,” said Strong. “Society is changing—people are becoming much more inclusive, they’re becoming aware of people who have been excluded. Disney’s Marvel Studios and Warner Bros., the two film studios that dominate the comic book movie landscape, have yet to feature a lead character who is LGBT. Warner Bros. released its first female superhero-fronted film—Wonder Woman—in 2017, while Marvel just recently released its first female hero-fronted movie, Captain Marvel. Shazam! star Zachary Levi told PinkNews he wasn’t aware of Shazam, the superhero first introduced in DC Comics in 1939, before researching the role. But he quickly grew an affinity to the part. The Shazam! movie has been gestating at Warner Bros. and New Line Cinema for a long time. At one point, Dwayne “The Rock” Johnson (who is credited as an executive producer of the film) was set to star in it, playing Shazam’s foe Black Adam. Later, it was reported that Johnson’s Black Adam would first appear in his own standalone movie, before a showdown with Shazam. Shazam! is released worldwide on Friday, April 5.